Spotted Reef Stingray while snorkelling at Temple, Ras Mohammed, Egypt, originally uploaded by Craig Grobler. Bluespotted stingray, (Dasyatis kuhlii) also known as Kuhl's Stingray is a stingray. It is light green with blue spots. Their disk width hovers around 67 cm. They are popular in aquaria but usually not distinguished from the Bluespotted Ribbontail Ray. The Ribbontail is rounder with brighter green and more/more vivid spots. 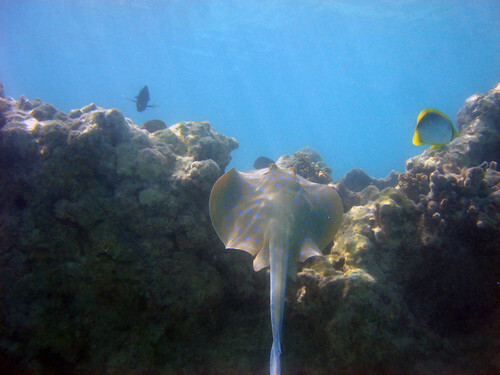 The Bluespotted Stingray is also larger. Temple is a local sites just off Sharm El Sheikh. The local dive spots offer calm conditions and vary a lot on their underwater landscape. They go from steep walls in Ras Nasrani, to coral gardens in Ras Umm Sid or shallow sandy areas at the Gardens that end on drop offs. Some have massive pinnacles like Temple and Ras Katy that almost reach the surface and others have canyons like Tower and White Knights that go beyond 50m. They offer abundant marine life and are a channel for big creatures passing by.